THERE seems to be a constant with Hibernian that proving their mettle, proving they aren’t chokers but credible Championship challengers, always depends on what they do next time out. Or the time after that. With a trip to Kirkcaldy tomorrow – where Ray McKinnon’s third-placed Raith Rovers have conceded only one league goal – and table-toppers Rangers at home nine days later, the next few weekends are no different. Yet, the Leith club’s head coach Alan Stubbs is entitled to contend that his team are only in a position to cut the lead of the perceived champions elect from Ibrox from right to five points because they already have been cutting it in must-win matches. Not least at Falkirk on Tuesday. 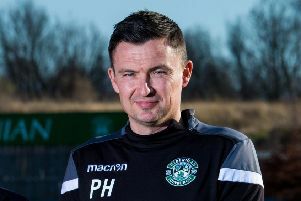 Gripes from Stubbs on the injustice of losing the Scottish Cup semi-final in April to Peter Houston’s side prompted the riposte from his managerial counterpart that Hibs should learn to deal with cross balls. Stubbs yesterday was able to offer up a statistic from the 1-0 win that allowed him to suggest “maybe we’ve improved” in that department. Hibs have to come up with answers to searching questions in the coming games. They will only reduce the gap to Mark Warburton’s Rangers – who face St Mirren in Paisley on Sunday – if they bring to a halt a run of seven straight home wins for Rovers, who scalped Hamilton Accies on their own turf in the League Cup two months ago. Stubbs has no doubts about what lies behind the Raith renaissance. “When they came to Easter Road I knew they’d assembled a good team. I know Ray from the pro-licence we were on together and I was impressed by him on the course. Stubbs, meanwhile, is keen to put across the idea that reducing Rangers’ chances of romping the title following their 11 straight league victories isn’t what all those at Easter Road are fixated on every time they take to the pitch. “We are honestly not going into games worrying about any other teams,” he claimed. “We’re going into games purely focusing on ourselves. We know if we pick up three points then we’ve done our job. “We’re doing that just now on a regular basis so that makes me happy. We’re gaining momentum but so are a couple of other teams. I’d like us to be gaining momentum and other teams showing signs of dropping.